One activity on our spring bucket list was to find a small garden area for Thomas as he loves getting his hands dirty, sowing seeds and watering. 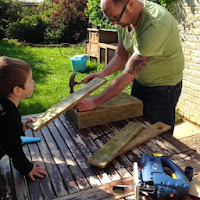 We've got a lot of plans for the garden this year so it was quite difficult to find a suitable spot that we could guarantee wouldn't be disturbed by our plans, so I decided that T's 'garden' would have to be portable. In the meantime T has declared that the top of the garden, 'the plot' as I call it, is his garden. Here, we have the greenhouse, raised bed, garage and driveway, it's also become a bit of a dumping ground (not for much longer) and is turning into a bit of a jungle. 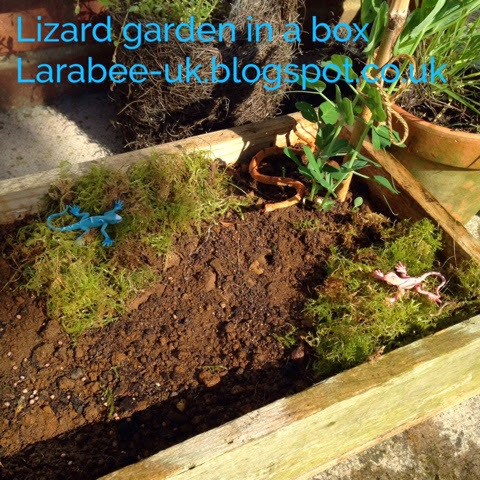 I love that T calls this garden, but now he has his own 'lizard garden' and I'm going to be getting the plot back to its former glory! After deciding to create a portable garden which could be located close to the house, I set about thinking what to make the garden out of. We've got a few pallets hanging about from another project so I started measuring and lo and behold I realised we could make a decent sized box to retain Ts garden. 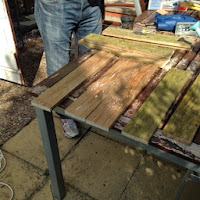 The hubs got to work cutting down the pallets, I specifically chose 18 inches as that was the length between each staple, this meant that we didn't have to waste time removing each plank from the pallet. The hubs nailed it together with the weathered side on the outside as I wanted it to look a bit rustic. We should have lined the box with a bin bag but didn't. I highly recommend that you do this if you make one! 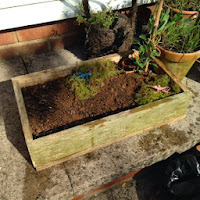 We planted some small pea plants, cress, radishes and some mixed salad leaves. We also made a couple of moss lawns to make it a bit prettier until the seeds sprouted! 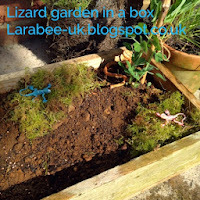 T chose to add a couple of lizards and a snake to his box, but you could add any small toy that you like. 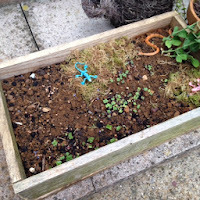 The idea is that T will be able to go and get himself some cress for sandwiches or radish as a snack or peas to make an omelette and serve with his own salad leaves. Just one week later the salad leaves and cress are coming through well, although it has had a fair amount of rain this week 😉. 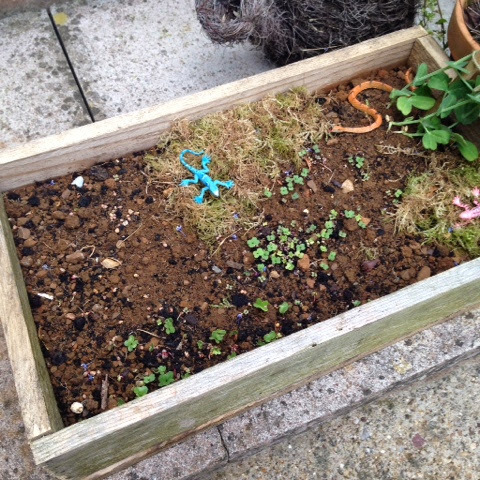 If you make a little garden tray for your children, I'd love to hear about it! There's so much to do in the garden at this time of year. I'm hoping to be able to get out in the evening soon to get some jobs done, have a great day. I hope Monday has been good to you Lx.